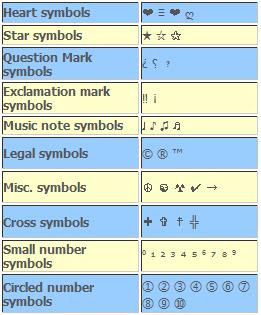 MSN Symbols is a website that gathered a complete list of MSN symbols and characters for your use. You can use these cool characters which you can use to create your own unique MSN name or personal message. This website has also grouped the symbols by category (what they symbolize) so that you can find what you need without even having to use a character map. Copy the symbol and paste it in Live/MSN Messenger and continue to create your msn screen name, there’s no need to mess around with ALT codes and tedious character codes.